This is a brief summary of a talk by Prof. Michael Pritchard, Department of Earth System Science in the Physical Sciences Breakfast Lecture Series of the School of Physical Sciences, on May 5, 2015. Michael Pritchard was introduced by Dean of Physical Sciences Ken Janda, who noted that Michael had received an Early Career Research Program Award from the Department of Energy. The video of this talk will appear on the School of Physical Sciences website. I just give a capsule summary here. Prof. Pritchard has developed a cloud resolving model down to 1-2 km resolution to enhance the Global Climate Models. 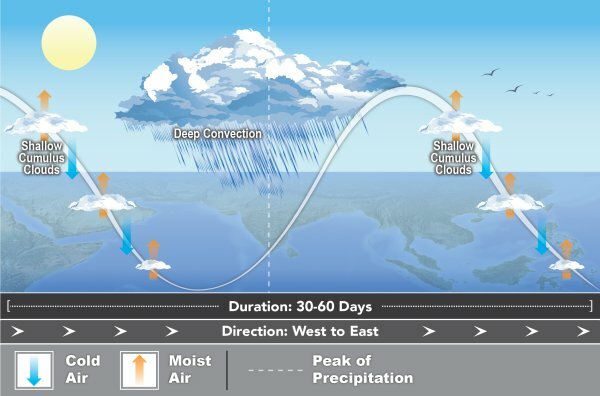 The present models have a missing weather pattern, they rain too easily, and there are problems with the daily cycle. The IPCC projections have hugh error bars, with a 2.1 to 4.7 degree C range. He uses a multi-scale modeling framework on a Kraken computer, of which he uses 10,000 processors. He recreates the Madden-Julian Oscillation (MJO), a tropical weather pattern that proceeds over 30-60 days, of calm, then high convection and rain, then calm again. The pattern moves from West to East. There are competing theories for this. He adds to the Community Atmosphere Model (CAM) to make it the CAM Super Parametrized Model (SPCAM). It has realistic MJO mesoscale convection systems. The length of inclusion is an 128 km storm length. The small scale is insensitive to the MJO. At the Orange County latitude, we are at the down part of the Hadley cell circulation from the equator or tropics. The down part is dry air that keeps us dry. Updating predictions of climate change, he finds that the MJO is sensitive to climate change, and would occur 10% more frequently with a century of climate change. For Bangladesh, which is largely a river delta, monsoons can bring a 1.5 meter sea level rise, that floods a major part of the delta. Mesoscale convective complexes form at nighttime and deliver half of summer rain. When this is modeled, he gets more extreme rainfall in SPCAM. There is a 7% rise in rainfall per degree C rise in average Sea Surface Temperature predicted by Global Climate Models. The Marine Layers act as a huge planetary mirrors, since they reflect solar radiation, as seen by their very bright whiteness from above. They occur in Southern California, and off of the West Coasts of Peru and Africa. They act to cool the planet. They are called Marine stratocumulus clouds. They are very sensitive to, for example, emissions from ship traffic. Expanding Marine cloud mirrors lower the planetary temperature rise. To approximate low cloud physics he needs to include that they are controlled by 20m x 250 m eddies. He includes these by using periodic boundary conditions in connecting many identical cells. This makes the simulation scalable to larger sizes. While Kraken has 130,000 processors, newer computers will be Stampede with 500,000 processors, and Titan with 300,000 processors. They also include Intel M.I.C combined processors, and Graphical Processing Units (GPU) by Intel with lower prices and high speed. The new computers will allow simulations with 32 km wide and 0.25 km (250 meter) vertically simulations. He received a question on how to measure the atmosphere with small scales. Satellites can measure the vertical liquid sum of water beneath them. This sum can then be compared to simulations. The model can test brightness and then weather. Another question was “Is the Marine layer shrinking?” There is not enough data to tell this. He was asked to recommend a starting book on the subject. He said Dave Randall has a book (Atmosphere, Clouds and Climate, which is part of the Princeton Primers in Climate, now in paperback). Randall will have a new textbook coming out this year. He was asked about who was working on geoengineering, and recommended Steve Davis in Earth System Science. He also mentioned work on injecting nucleating particles for making more clouds. This entry was posted in Climate Change, Solar Energy. Bookmark the permalink.